XPSTORM is a versatile software package for dynamic modeling of urban stormwater systems, river systems and floodplains including ponds, rivers, lakes, floodplains and interaction with groundwater. This combined 1-dimensional (for upstream to downstream flow) and 2-dimensional (for flow over land) software is widely used by private consultants and public agencies responsible for stormwater and flooding regulation, XPSTORM is one of the most stable and well-accepted modeling and design packages in the world, and has been tested and approved for use by the United States FEMA and UK Environment Agency. Please visit www.xpsolutions.com to download free trial versions of our water modeling software solutions. Simulation of stormwater and flooding for flow analysis is a constantly changing world. Traditionally, modeling was a "best guess" and relied heavily on assumptions made by the modeler. XP Solutions believes in providing you with the system variables needed - and interactive GIS tools to find that data - to produce the most accurate results possible so that your constituents and the people you serve remain safe, and property protected. Use XPSTORM for fully integrated hydrologic and hydraulic stormwater modeling, from cloud to ocean! This comprehensive software will allow you to model with confidence. XPSTORM is a comprehensive hydrologic and hydraulic modeling environment for stormwater systems and flood management. It is applied to a wide range of water resource management, design and emergency action planning issues every day by thousands of users. Integrated Stormwater Modeling. Combine comprehensive hydrology and hydraulics in the same model. Don’t jump between two or three different stormwater packages to build a complete stormwater model. 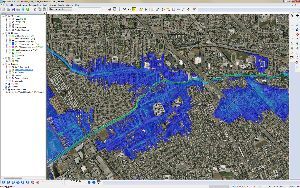 XPSTORM offers the tools to perform fully integrated system modeling, from rainfall to channels, pipes, streets, inlets, ponds, weirs, pumps, catchments, groundwater table, overland floodplains, rain gardens, infiltration trenches and more. Model the Real World. You need a model that accurately reflects the physical realities of your drainage system. Fully linked 1D and 2D modeling allows you to see the true behavior of stormwater flow in natural and engineered systems. Minimize the need for approximations and “modeling tricks” by using XPSTORM! Advanced Design. Automatically identify flow choke points and let XPSTORM design solutions (pipe sizes, slopes). Use automated Detention Pond Optimization methods to configure storage. Fully dynamic hydraulic analysis will allow you to complete LID design to maximize the technical solution at lower costs. Localization. Your hydrology, your way. With over 15 hydrologic methods available and numerous ways to input real or synthetic rainfall data, XPSTORM allows you to model the appropriate rainfall/runoff for your project in your region. Easily Share Models. 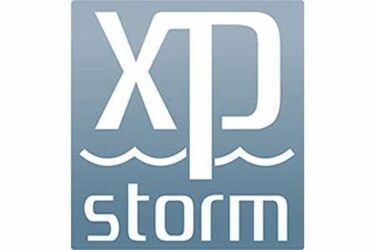 XP Solutions offers a free Reader of XPSTORM models called XPVIEWER. Users encrypt models with this add-on module so that others can view an un-editable model.